Pure Belly has chosen to giveaway a Pure Belly Wrap to one of All Natural Mom 101’s Readers. Winner will receive a Pure Belly 3-in-1 Pregnancy & Postpartum Wrap of their Size & Color of Choice. The Giveaway Starts March 17th-March 28th. Open to US & CAN residents. 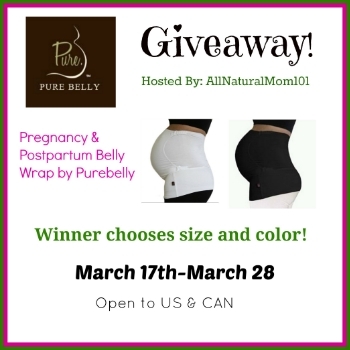 Be sure to check out All Natural Mom 101’s Review on the Pure Belly Wrap HERE and enter the giveaway via Rafflecopter below! How awesome to have a product that is both for pregnancy and post partum. I love when products are multi functional! Previous post: Putting it together…..